Chick-FIl-A Test Menu - Cooking With C.C. A few weeks back, some friends of mine outside of Huntsville saw an article in Business Insider about new menu items being tested by Chick-Fil-A. Huntsville was identified as one of the test markets for the new Harvest Kale & Grain Bowl and the Egg White Grill Grain Bowl. It was suggested that I needed to go check out these new items and report back. The first Chick-Fil-A opened in 1967 in the Atlanta area. Over the almost 50 years it has been in business, it has become a standard bearer in the fast food industry. They have focused on values, training and of course the food. Chick-Fil-A has been the first job for many a teen across the south. Chick-Fil-A and the Cathy family are respected for the way they run the business and their local community support by their owner/operators. So, I called the restaurant near my house and scheduled an appointment to meet with the Owner/Operator to get more information about the new products. We had a great conversation about the new menu items and much more. First I asked about the test menu items and how the process works. The corporate test kitchen develops and tests recipes for new products. They also test with some consumers as part of that development. The next step is to test the new items with consumers in select markets. He told me that when a product makes it to the field test stage it almost always moves to the regular menu. The two grain bowls are being tested in San Francisco Bay Area, Sacramento, Tampa, FL and Huntsville, AL. These new items are aimed at people looking to eat healthier at the fast food location. We discussed that there are two pressures on these changes for Chick-Fil-A – expansion into areas outside of their core southern roots and changes in the demographics of the typical Chick-Fil-A guest. (As an aside, in a recent press release, they have announced their first 3 locations in Las Veags.) So, why Huntsville? Not sure, but my guess is that Huntsville represents the “control” group in the study – the traditional core Southern customer, but with the growth in the area, we also have a lot of transplants, so not completely sure. I asked about how the products were performing and was told that sales are growing. The test started in late-August, but they have just begun to promote the items. First couple of weeks was to test the supply line and processes. The test runs through the end of October, but these will remain available in Huntsville at least through the end of February, of course if they move to the general menu, they will continue to be available. 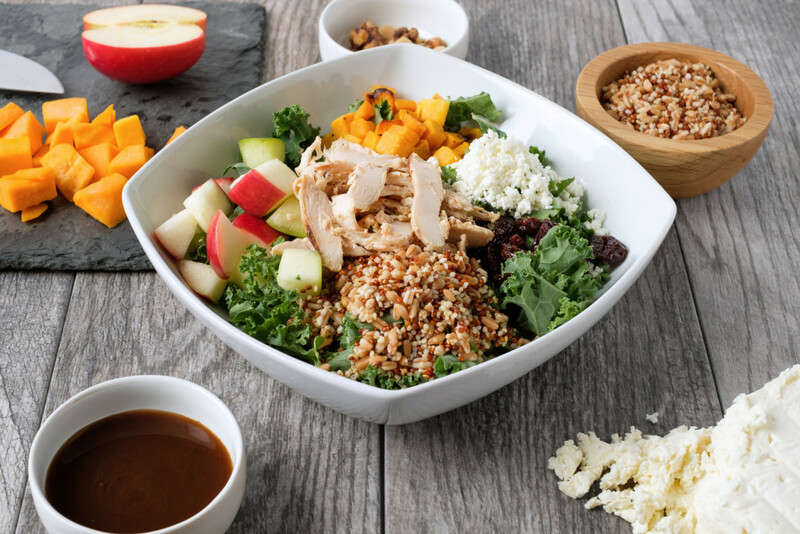 The Harvest Kale and Grain Bowl starts with a bed of chopped kale and includes red quinoa, white quinoa, farro, roasted butternut squash, diced apples, a mix of goat and feta cheese and dried cherries. The entree included a small bag of granola and roasted nuts. The standard dressing is their new Light Balsamic Vinaigrette. It is topped with sliced grilled chicken (you can order it without the chicken for a vegetarian entree). The salad clocks in at 370 calories (without the dressing) and 22 grams of protein. I was going to purchase one when I left, but they gave me one to try. I took it back to the office and mixed it together. I grabbed a couple of paper plates and separated the salad to have two other folks in the office try it. The two folks represent different ends of the spectrum – one of them is at Chick-Fil-A at least 3 times a week and often more, the other has been very health conscious and is watching their diet very carefully and lunch is often kale with chicken breast. What I didn’t realize is that since I had separated the salad, they thought it was a recipe I was working on, so their comments were really a blind taste test. The CFA person really liked everything, except they thought that the butternut squash didn’t add anything except “I guess another vegetable I would be eating.” The other person liked the squash and the apples, but was not a fan of adding granola to the salad. As for me, I am not a fan of kale, but in this salad, there was enough other stuff that the kale was OK. I thought the balance between the different flavors and textures was very good. The dressing was just the right amount. I like granola on salads so I really like the crunch of the granola and nuts. The cheeses went very well with the dish although, I like goat cheese, but don’t often buy it to put on a salad. All in all, I thought the Harvest Kale and Grain Bowl is a success and I would buy it. The price here was set at $8.19, so a bit on the pricy side. A few days later, I went to the CFA near my office and picked up an Egg White Grill Grain Bowl from the drive-through. I tried that one at the office. I wish I could say that this one was as good as the salad bowl, but it wasn’t. First, the egg whites were completely flavorless – they need at leas some seasoning. The bowl includes the same quinoa/farro mix as the salad along with grilled chicken on top. It also includes a Monterrey jack and cheddar cheese blend. It includes a package of jalapeno salsa for the top. The bowl is constructed so that the grains are on the bottom covered with the scrambled egg whites and cheese and topped with the chicken. Wasn’t really where you could mix it very well, so I was eating the top part and the grain was left for the end. As I mentioned, I started without the salsa and the flavor was flat and bland. I added some of the salsa and the salsa just overwhelmed everything. Believe it or not, I’m not a spicy food eater and the salsa had a little heat, but not too much for me – it was just overpowering. The chicken was the real bright spot as you would expect. The breakfast bowl is priced here at $4.95 and I can’t recommend it. The stats on this one is 220 calories and 29 grams of protein (without the salsa). In a related announcement, they are testing three other new breakfast items in some other markets (New York, New Jersey, San Diego, Columbia, SC and Washington, DC). These items are: Hash Brown Scramble Bowl, Egg White Grill Bowl and Berry Protein Blend. During our discussion we also talked about the latest products released in July (after the same process of in-market testing, just not in Huntsville), the Egg White Grill Breakfast Sandwich. (Press release here.) So, the next day I went back to the restaurant near the house and picked one up in the drive through. This one is stacked together, so I couldn’t really try just the egg whites to see if they were cooked a little differently. The Egg White Grill includes grilled chicken, grilled egg whites, american cheese and a toasted multi-grain English muffin. This selection comes in at 300 calories and 25 grams of protein. (I picked up the top part of the muffin in one of the pictures so you can see the rest of the sandwich.) This one was quite tasty, but the English muffin was a bit on the chewy side. I was neutral on this one – I will probably go buy it again and give it a couple of more tries, but won’t go out of my way. In a related part of my initial discussion, we talked about replacing menu items. There are no plans to change or eliminate any of the core menu. Last year, the cole slaw and carrot salad were replace by the superfood side salad. I learned that the cole slaw was made completely by hand including slicing all of the ingredients – no slaw mix was used to make it. He told me that right before they were removed from the menu they would spend about an hour making the cole slaw and sell about 10 a day – just wasn’t making financial sense anymore. Likewise, the chicken salad has just recently been removed from the menu – again, this was made completely by hand and the sales have been dropping over the last few years and they weren’t selling enough to justify the effort. On the other side, he told me that when they originally introduced the Chick-n-Minis(TM) he wasn’t sure they were going to catch on. Now they one of the best selling breakfast item on the menu. So, Chick-Fil-A is consistently working to keep up with the trends and changing tastes of their guests and these two new grain bowls represent a bit of a departure for them. According to the Business Insider article, they are the first major fast food chain to test quinoa and farro. If you live in Huntsville – go give the Harvest Kale and Grain Bowl a try. If you are elsewhere, hopefully you will see those in your area sometime next year. Is there any more nutritional information available for the harvest grain bowl? Unfortunately, since it isn’t on the full menu, they haven’t put the full nutrition on the website. All they had in the press release was that the bowl with chicken is 370 calories and 22 grams of protein. The vegetarian option (without the chicken) is 300 calories with 9 grams of protein. I don’t know if the Huntsville locations have more information at the store. I’ll have to go check. Didn’t think to ask that when I was interviewing the owner/operator. Thanks!